· so no one (including babywearer and the baby) is hurt in the process. · to truly enjoy the time we share with baby while babywearing without fearing their safety is at risk. · to be a good example to the public so we can promote babywearing by showing off how comfortable and enjoyable babywearing can be. It is important to practice safe babywearing ALL THE TIME as much as it is important to hold your child’s hand when you are crossing the road ALL THE TIME… cos you never know what awaits you at the other end. While you think that it is safe to wear your baby wobbly and loose in a carrier for ‘only 5 minutes’ as you finish your chore, your baby might be sliding down without notice (as you were too busy and occupied with your chore) and hurt himself. While you are busy selecting your groceries, your baby might be doing the same behind your back (while being back carried) and hitting you with a can (ouch!). While you have him dangling in a carrier way below your tummy, you wonder why he kept crying for attention when he is already being worn. And, remember the times you almost sat on him cos he was being such a sweet baby and snoozing at the back… quietly? Babywearing may be fun and enjoyable but let us not forget to be alert and to practice safe babywearing at all times as you never know what could happen around the bend just when you weren’t thinking (and, yes, aren’t us trying to multitask while we wear our babies?). It is important to practice safe babywearing as our child safety is a vital issue that we should never compromise with. Besides, safety issues came together with responsibility and trust. How? As a mother, we may have many reasons to go for babywearing. It can be multitasking reason, soothe fussy baby, to get closer to little one or just because trendy and tempting carrier available in market. We can have thousand different reason yet we should never stop focusing on our child safety. Therefore, we should always check to ensure that our baby can breath easily in sling, been carried in correct posture, carried in safe carrier and the list goes on. Yes, this is a part of responsibility, the same one like providing good food, take good care or give good education. If we can't afford practice safe babywearing then maybe we shouldn't babywear. Better safe than sorry right? Of course safety is a serious issue so we should follow the step of safety in babywearing to minimize risk and gain babywearing benefits. Besides responsibility, trust is also an element in safe babywearing. Ever wonder where to see 100% trust? Husband and wife? 95% i guess...parents to kids? 97% maybe...friend? Actually, it's kids to parents. Ever see when father throw his kid to the air? How many percent the kid trust that his/her father will catch him/her? Yes, 100% absolutely. And because of this trust, we shall never take safe babywearing for granted. 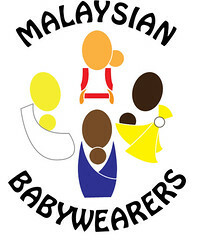 As our child depend on us so it is our duty to ensure we babywear them safely. Lastly, by babywearing safely we will always have satisfaction in our heart that we have give our best to our own child. What else matter than our child right? IBW'10 Contest 2: We want more Babywearing Men!